Internal balance sheets: For reporting financial condition within your business, internal balance sheets include much more detail than external ones, either in the body of the financial statement itself or, more likely, in supporting schedules. 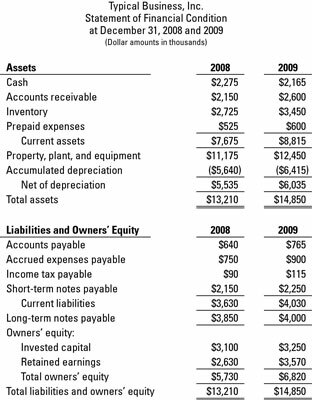 This figure shows an internal balance sheet for Typical Business, Inc. Greater detail allows for better control, analysis, and decision-making. Internal balance sheets and their supporting schedules should provide all the detail that you need to make good business decisions. External balance sheets: Balance sheets presented in external financial reports (which go out to investors and lenders) don’t include a whole lot of detail. This figure shows a Typical Business, Inc. external balance sheet. External balance sheets must classify (or group together) short-term assets and liabilities. For this reason, external balance sheets are referred to as classified balance sheets. The CIA doesn’t vet balance sheets to keep secrets from being disclosed that would harm national security. The term classified, when applied to a balance sheet, doesn’t mean restricted or top secret; rather, it means that assets and liabilities are sorted into basic classes, or groups, for external reporting. Classifying certain assets and liabilities helps readers of a balance sheet more easily compare current assets with current liabilities.